Brought to you by Jessica Jean Weston, Holistic Health Coach and Owner/Executive Chef of Superfresh! 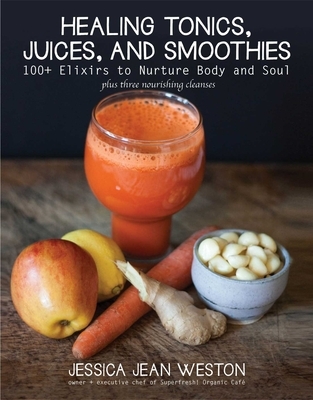 Organic Café, Healing Tonics, Juices, and Smoothies provides readers with simple recipes that debunk the fanciful mystery of adaptogens, herbs, superfoods, and fermentation for everyday enjoyment, while still dressing to impress all those who happen to grace your kitchen space. With several staple drinks for day-to-day consumption, medicinal shots for prevention and seasonal wellness, and fermented concoctions for an extra special probiotic-rich kick, there’s something for all forms of hydration! Along with the recipes, you’ll find full-color photographs of the drinks, details on the superfoods that are used to make them, and a comprehensive food glossary. Jessica Jean Weston is owner and executive chef at Superfresh! Organic Café. With a BA in medical anthropology from Ithaca College and as a graduate student of the Institute for Integrative Nutrition, Jessica has spent her career exploring the broad subject of food as medicine with Mayan healers in Belize, on organic farms, and with herbalists, shamanic practitioners, and more. Weston's personal journey to health, navigating a series of food intolerances as well as what made her feel most vibrant, led her to a non-GMO, plant-based diet free of soy, gluten, dairy, eggs, and meat. Recognizing that everyone has their own path to explore, her goal is simply to share her experiences and knowledge by creating delicious, approachable cuisine with the understanding that no two beings are alike.